G-FORCE 200P Motorcycle Alarm + Pager. Remote controlled alarm features new G-Force sensor w/remote controlled sensitivity adjust, 4 watt pager with audible/vibration beeper, starter disable, flashing lights, warning led, and piercing siren. 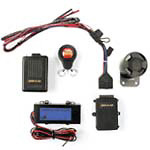 When purchasing the Armed Guard G-FORCE 200P Motorcycle Alarm + Pager, consider the other items listed below. You can add all desired items from below at one time by clicking the Suggested Items Add Page link.